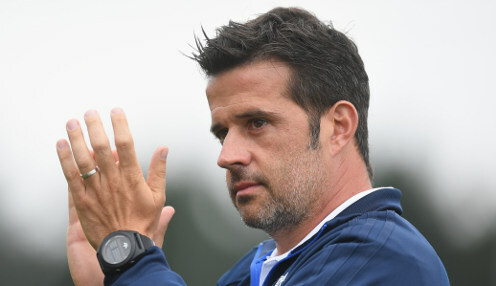 Everton boss Marco Silva says he is starting to see real progress from his side as they prepare to host Crystal Palace in the Premier League on Sunday. It was a tricky start to the season for the Toffees but the Merseysiders are going into the game against Palace following back-to-back wins against both Fulham and Leicester City. Silva has been pleased with his team’s recent form and the former Watford boss says he can see improvements in both games and in training. He told Sky Sports: "I'm starting to see progress. Not just during the matches, which is of course the most important thing, but in the training sessions as well. “In two or three games we didn't achieve what we wanted, and at that moment of course comes some lack of confidence, but I have to convince my players of what I want, of what is my way." He added: "I'm really happy because I am seeing very good professionals. To see professionals working hard every day, making a big commitment to the club with a desire to improve every day is something I want. That's the only way they can play with me. That's the only way they can play at a high level with a club like Everton." Everton are 1.80 to win, 3.60 to draw and 5.25 to lose against the Eagles.